The Galaxy S Plus has you covered in terms of organizer and office features, offering everything from a file manager through all sorts of time-keeping apps to a document viewer. As usual Samsung has included the My Files app – a simple to use but functional file manager, which also doubles as an image gallery. It can move, copy, lock and rename files in bulk, even send multiple files over Bluetooth. It will only browse the memory card and the large internal storage (it can’t access the inbuilt memory like some third-party file browsers). The notes app is very simple and easy to use. You enter a note and then it's displayed on a virtual pin board. You can change the colors of the notes. The notes are interactive and recognize phone numbers and addresses which you can call or view upon a touch. The ThinkFree Office is pre-installed – a document viewer and an editor. It works like a charm and is capable of pinch zooming. Both panning and zooming are fast and the overall performance of the Office package is excellent. There is also a nicely touch optimized calculator. The Voice recorder app has seen no changes since the original Galaxy S. It's very easy to use and you can listen to your previous recordings any time by hitting the list button. The clock app offers alarms, world clock, stopwatch and timer. They are all pretty much self-explanatory. Basically everything you might need is present on the Galaxy S Plus in terms of organizing your daily life. And anything extra you might need can be found in the Android Market. 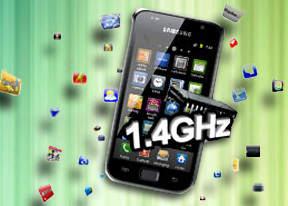 The Samsung I9001 Galaxy S Plus comes with a GPS receiver and offers A-GPS for quicker satellite lock. Google Maps is the titular application and its Street View mode is probably the best part of the deal in places where turn-by-turn voice navigation isn’t yet offered. Our I9001 Galaxy S Plus came with Google Maps 5.x with Navigation (where supported). While it requires a live internet connection as you go, there’s offline rerouting too – if you stray off your course, Maps will recalculate the route without the need for an Internet connection. You can’t change the destination without connection though. You also get 3D buildings (where that's available), two-finger rotation and tilting, and more. If the Street View is available in the area you're interested in, you can enjoy a 360-degree view of the area. When the digital compass is turned on it feels like making a virtual tour of the surroundings! Voice-guided turn-by-turn navigation using Google Maps Navigation is available in select countries and unless you live in any of them the best you can do is plan a route in advance and keep an eye on your current location during travel. The Google Maps app also offers a rich database of POIs: cafes, restaurants and all sorts of businesses like banks (ATMs too), hospitals, police departments and much more. The Samsung I9001 Galaxy S Plus is running the latest available version of Android and has a WVGA screen, giving you access to the whole Android Market (some apps won’t run on older versions or low-res screens).